There is a old saying in the sign business that goes like this ” A business without a sign is a sign of no business “. All businesses need to get their name and information out to the public. Sign printing allows for the disbursement of information. Sign printing is as old as business itself. The oldest stores and businesses needed some way or another to let people know what they did for the community. Sign printing itself is a pretty self explanatory phrase. It is basically the printing of signs. Today’s sign shops use large format printers to print signs. These state of the art large format printers use eco solvent and latex inks that are environmentally friendly. These inks produce a wide array of vivid and bright colors that are used for indoor and outdoor prints. Las Vegas is the sign capital of the world and consequently, much sign printing is done here in Las Vegas. The reason for Las Vegas having so many sign shops and print shops is because of all the casinos, trade shows and conventions that are here in Las Vegas. These trade shows and conventions bring millions of people to Las Vegas and the amount of signage that is needed is tremendous. Every company that comes to Las Vegas for a trade show or convention needs signs as props and backdrops to sell their products. In addition to the conventions, there is a demand for signage for all the companies that support the trade shows and conventions. Sign printing is just one of the support industries for people coming to Las Vegas. If you are inn need of sign printing, just do a search under ” sign shops or sign printing ” with Google and you should be able to find many options for y our sign printing needs. Banner Printing In Las Vegas. If you are in need of banner printing in Las Vegas, you should have no problems getting your vinyl banner printed for a reasonable cost. Las Vegas is the sign capital of the world because of all the casinos , trade shows, exhibits and conventions. To support these events and places, there has to be a large sign and print industry to be able do banner printing. Most of, if not all the sign shops in Las Vegas have state of the art large format printers. Mimaki, Mutoh, Hewlett Packard, Roland are just a few of the top named brand large format printers capable of doing banner printing. Because these large format printers are so advanced, it takes little time to be able to print a full color vinyl banner on these machines. A 3 foot by 8 foot vinyl banner in full color can be printed on these printers in less than 15 minutes.Some of these printers are capable of printing 96 inches wide by however long you need your banner. The common size for these large format printers is usually 63″ or 54″ wide. All sorts of different materials can be printed on. The toughest part to banner printing is getting the design just right for the end user. Graphic design programs like Adobe Photoshop, Adobe Illustrated, Flexi-Sign, Sign Lab are all made to design signs and banners. 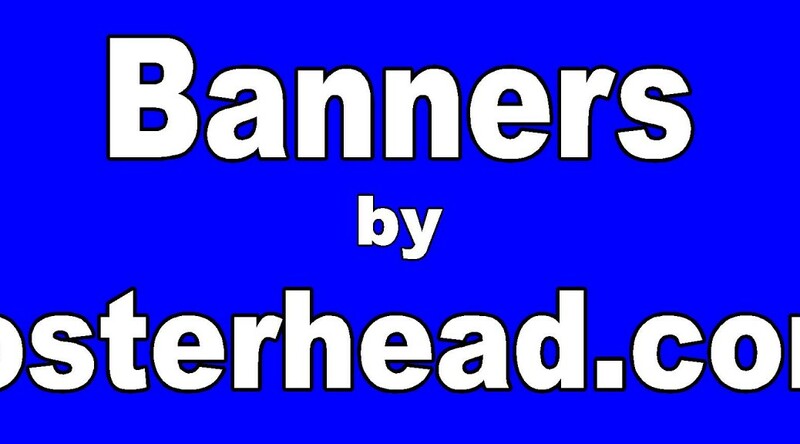 Many people are able to design their own vinyl banners on programs that are on their home computers. The average banner is printed on a 13 ounce banner material in eco solvent or latex inks. Different weight vinyl banner determines the thickness of the banner. The higher the thickness or weight, the tougher the banner material. The eco solvent and latex inks that are used on vinyl banners allow for bright and vivid colors for indoor and outdoor banners. Banner printing is easy to find in Las Vegas. Just go online or look in the telephone book to find a banner printer close to you. North Las Vegas Business Signs. If you are looking for North Las Vegas business signs, there are plenty of well equipped and quality sign shops in North Las Vegas. You do not need to go to the City of Las Vegas to find good value for your signage needs. There are plenty of North Las Vegas business signs facilities to choose from. Whether you are looking for vinyl banners, window lettering, sidewalk signs or electrical signs, there is a North Las Vegas company available to assist you. It is important to remember that any North Las Vegas business signs store that puts up electrical signs needs to be licensed by the Nevada State Contractors Board. it is also important to remember that any electrical sign company in North Las Vegas needs to use electrical parts for the signs that are approved by Underwriters Laboratory (UL Listed ). You need to make sure that any North Las Vegas business signs company has the necessary expertise and equipment to make a sign. State of the art large format printing using eco solvent inks and latex inks are the rule, not the exception. These inks are environmentally safe and ecologically friendly compared to the printing inks that were used years ago. Sign shops should have the newer printing equipment. These newer large format printers produce very bright and vivid colors for both indoor and outdoor signs. With the tough economy that everyone is facing in the United States, it is important to get the right sign for the right price. There are several sign industry affiliates that promote safe and quality signs and you might inquire as to whether your chosen sign company is a member of a organization that promotes safe and quality signs. To find North Las Vegas business signs, just go online or look in the yellow pages under North Las Vegas business signs. North Las Vegas Banners Work For Increasing Business. North LAs Vegas banners is a marketing strategy used by North Las Vegas businesses to increase sales . In these tough economic times, North Las Vegas stores are using North Las Vegas banners as a way to promote their products in a large way. Merchants are using banners as a advertising mechanism on their outside walls and surrounding fences to advertise their products. For example, several pizza restaurants are advertising ” Large Pizza $9.99 ” specials on banners and then hanging the banners on the outside of their stores to attract attention. The pizza restaurants are having great success with this type of advertising. North Las Vegas banners are working for them. North Las Vegas banners come in a variety of shapes and sizes. Stores can get smaller vinyl banners, such as a 2ft x 4ft or get the more traditional size of 3 foot x 8 foot. Even larger banners are possible to get at a reasonable price. With summer in mid season in North Las Vegas, many stores are advertising “shaved ice” “pools” or other merchandise that is seasonal. The North Las Vegas banners are cheap and both easy to hang with common items such as rope, zip ties, screws, etc. Best of all, the vinyl banners can be taken down once the sale or season is over and be re-used at another time. Many pizza restaurants alternate pizza sale banners, chicken wing banners and pasta banners in order to always give the pizza restaurant a new and fresh look. Your local sign shop or print shop can assist you with your vinyl banner needs. The going rate for a vinyl banner in full color ( meaning any number of colors you want ) is about $2.00 a square foot. These North Las Vegas banners usually come grommeted so as to make hanging the banner very simple. If you are looking for paradise Las Vegas signs, you can find them in the suburb of Las Vegas . Paradise Las Vegas is a suburb of Las Vegas, Nevada and that is where you can locate Paradise Las Vegas signs. Paradise Las Vegas signs contains many signs shops with a well rounded mixture of capabilities and skills. Many of these sign facilities have state of the art technology to make sure you get the right sign at the right price. If you are looking for monument signs, pole signs, channel letter signs, vinyl banners, or any number of other signs, Paradise Las Vegas signs can be found at a reasonable price. Many of the sign shops in Paradise have state of the art printers with the manufactures being Roland, Hewlett Packard, Mutoh, Mimaki, and many others. These large format printers are using eco solvent and latex inks that are very ecologically friendly. It was not so long ago in the print industry that hazardous inks were used that caused health concerns. But with the invention of the modern day large format printers, the current inks are very environmentally friendly. That is good because these inks can produce very vivid and bright colors to show off your printed signs. Paradise Las Vegas signs can also make you a wonderful vinyl banners as well for all sorts of different occasions such as sports banners, party banners and business banners. These banners will be printed on 13 ounce banner material with eco solvent or latex inks that will allow you to advertise your event or business with pride. Tradeshow Banners Help Sell Your Products. Tradeshow banners are a excellent way to visually reinforce your goods and services at tradeshows. Tradeshow banners are capable of help selling whatever goods and services you have by them giving credence to your sales pitch. There are many types of tradeshow banners that are very popular. Retractable banner stands, step and repeat banners and vinyl banners appear to be the most popular tradeshow banners. Step and repeat banners are also popular tradeshow banners. They allow for a repetitive phrase on the banner so that when someone stands in front of it, no matter what angle the person is at, the step and repeat banner allows for a logo or company name to be seen in the background. Many companies put their models in front of these types of tradeshow banners. Common vinyl banners are also very popular at tradeshows because they can be set up in minutes and taken down and saved for another show. They are also very inexpensive and come in a variety of sizes. Las Vegas Rush Order Signs Are Available. Las Vegas rush order signs are available in Las Vegas because of the enormous sign industry. Las Vegas is known as the sign capital of the world because of all the casinos, trade shows and conventions that are located in ” Sin City ” Consequently, obtaining Las Vegas rush order signs is not a problem. There is a great need for qualified sign shops in Las Vegas because of the great demand for signage due to the casinos and trade shows. Millions of people visit Las Vegas annually because of the trade shows and conventions and sometimes their banners and signs are forgotten or lost in transit. With sign shops in Las Vegas having state of the art facilities, getting your Las Vegas rush order signs is not a problem. The major sign suppliers of the world are represented in Las Vegas because of the high demand for products. Most of the sign shops have state of the art equipment such as large format printers made by Mimaki, Mutoh, Roland ( just to name a few ) These large format printers use latex and eco solvent inks that produce a wonderful array of colors that are bright and vivid. These inks are environmentally friendly as compared to the inks just used 10 years ago. Sign shops in Las Vegas also use a variety of cutting edge technology for manufacturing channel letters, cut steel, metals etc. If you are in the need for Las Vegas rush order signs, just contact a reputable sign shop in Las Vegas to assist you. 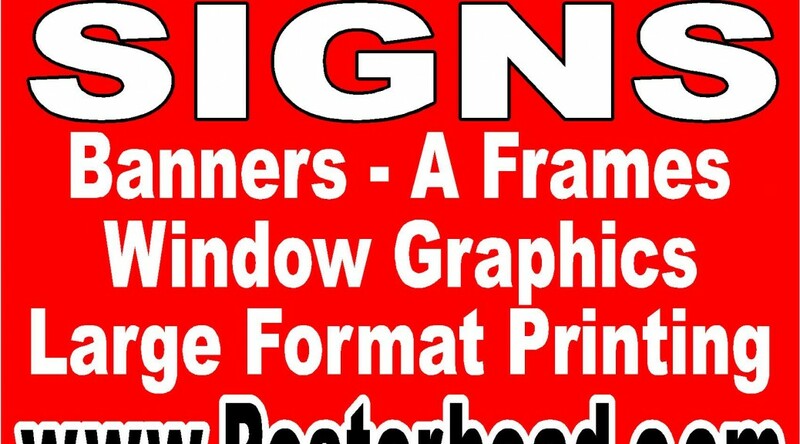 You can either bring your design into the shop or have one of the graphic designers assist you in designing the perfect sign for you at a reasonable price. Once the design is complete, the sign shop can go about and manufacturing your sign in a expedient fashion. Fast Las Vegas Banners To Help Your Business Grow. In these tough tumultuous times, businesses are trying everything to try to stay competitive and survive. Many businesses are turning to fast Las Vegas Banners as a way to advertise their goods and services. Fast Las Vegas banners offer an affordable and easy way to stay competitive. There are many sign shops in Las Vegas employing state of the art equipment to print and manufacture signs. The reason for so many sign shops is simple, Las Vegas is the trade show and convention capital of the world. With all the casinos and the signage they require, the trade shows and Las Vegas conventions require a inordinate amount of signage. Banners and backdrop signage is very popular at these conventions. Portable retractable banner stands are also very popular at these trade shows. Fast Las Vegas banners are made with state of the art large format printers such as Mimaki, Mutoh, Roland and Hewlett Packard. These printers use eco solvent and latex inks that produce bright and vivid colors. These inks are ecologically friendly compared to the previous generations of inks that were at times hazardous. The fast Las Vegas banners are very easy to print with these large format printers. A 3 foot by 8 foot banner takes about 15 minutes to print in high quality with these printers. The vinyl banners usually come grommeted and that makes them very easy to hang and install. Common hanging equipment includes a zip tie, screws with a washer, rope and bungee cords to just name a few. Large vinyl banners can be installed in just a few minutes in most cases and taken down in less time. If properly cared for, these banners can continue to be used over and over again. If you need fast Las Vegas banners, just contact a local Las Vegas sign shop. Large Banner Signs In Las Vegas. Large banner signs in Las Vegas are no problem. Las Vegas is the sign capital of the world and consequently, there is a large support industry to make and repair signs in Las Vegas. What helps Las Vegas to be the number one sign place in the world is all the casinos and the Las Vegas Trade Shows and Conventions. There are more trade shows and conventions in Las Vegas than any other place in the world. There needs to be many support industries to maintain the needs of the trade shows and conventions. Many people come to Las Vegas for the conventions but forget their signage or worse, the signage gets lost in transit by the airlines or damaged. If this is the case and people need their large banner signs, they should take comfort in the fact that there large banner signs and other signage can be made in a quick and professional manner. Large banner signs are printed on large format printers utilizing state of the art technology. These large printers use eco solvent and latex inks that are made for indoor and outdoor use. The inks are environmentally friendly and do not pose a hazard to health , as such was the case with the older industrial inks that were used in the printing process. The newer inks provide for a much more bright and vivid colors that bring out the design of the large banner signs. If you find yourself in Las Vegas without your necessary signage for your conventions or trade shows, just contact one of the many Las Vegas sign shops to assist you in replacing your lost or forgotten signage. Not only will you find that the quality of work of the LAs Vegas sign shops is excellent, you will probably find that the cost of producing the signage was cheaper than what you paid back home. Business Vinyl Banners Work For Increasing Sales. 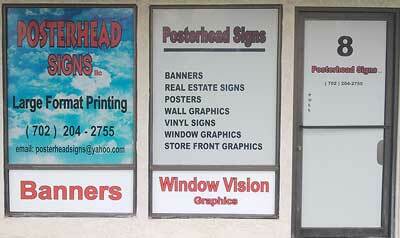 Business vinyl banners are being use in Las Vegas by stores and merchant to increase sales. Stores have seen increased sales through large vinyl banner advertisement. These business vinyl banners are being used to create awareness of the goods and services a business is selling with excellent results. Merchants in Las Vegas are learning that they can use the outside of their buildings and stores as a advertising platform to help spread advertisement. Putting up a 3ft x 8ft business vinyl banner on the outside wall of a store helps let passing motorists know what is on sale or in stock inside your store. The business vinyl banners are easily noticeable because they are so large. Many businesses are buying the 3ft x 8ft vinyl banners for $39, and others have decided to put up larger business vinyl banners. I have seen furniture stores put up 5ft x 30 ft. banners to advertise mattress and furniture sales. At $2.00 a square foot, these 5ft x 30 ft banners are priced at around $300.00 A couple of sales and the business vinyl banners pay for themselves. Many stores are rotating their business vinyl banners so as to always give the store a changing appearance. The banners can easily be taken down and stored so that they can be used over and over again. With just a few banners, the store appearance will always give the appearance of something ” fresh ” is going on. Large vinyl banners are a great bang for the buck and should be considered in any marketing scheme for your store. They are very simple to install and take down and therefore easily be changed out. They vinyl banners are very inexpensive, with the average square foot price of around $2.00. The large vinyl banners are very visible and will certainly grab the attention of passing motorists and people walking by.